With so many different scrapbook paper cutters available, it can be hard to decide which one best fits your needs. Luckily, LoveToKnow Scrapbooking is here to help. Why Buy a Scrapbook Paper Trimmer? Theoretically, you could scrapbook without a paper trimmer. It's possible to crop photos and cut paper for borders using scissors, but this is time consuming and requires a steady hand. A trimmer makes it easy to quick paper quickly, giving you more time to focus on the design aspect of creating a scrapbook layout. When purchasing a trimmer for scrapbooking, you may find yourself wondering why you can't just grab a paper cutter from the nearest office supply store. The main difference between scrapbook paper cutters and the paper trimmers available from a store such as Staples or Office Depot is that scrapbooking trimmers are designed to cut 12x12 paper. If you scrapbook in the 12x12 size and are working with a trimmer designed to cut 8 ½ x 11 paper, you're going to get frustrated pretty easily! Certain scrapbook trimmers, such as the EK Success Cutterpede, also have the ability to let you change blades. This lets you quickly cut deckle, wave, zig-zag or scalloped edges without the hassle of trying to line up the pattern on your decorative scissors. Unfortunately, there is no "best" paper trimmer for scrapbooking. Just as every scrapbooker has a slightly different style she uses when creating a layout, every scrapbooker is looking for something a bit different when purchasing a paper cutter. In fact, it's not uncommon for the long-time scrapbooker to have four or five trimmers in her craft room that she purchased while searching for the "perfect" paper cutter. 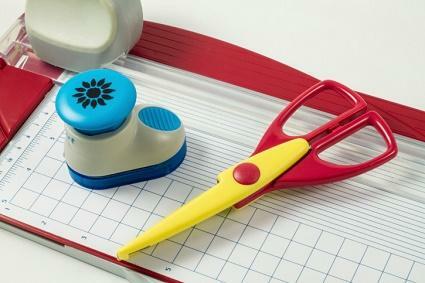 When buying a scrapbook paper cutter, there are several factors to consider. How much do you want to spend? There are scrapbook paper cutters available for every budget. Many of the popular trimmers cost less than $20, but you can also purchase heavy duty trimmers for $80-$100 or more. As a general rule, however, guillotine trimmers do tend to be more expensive than rotary blade trimmers. What do you plan to use your trimmer for? Obviously, you want a paper trimmer that can cut photos, cardstock, and patterned paper. But, some of the heavy duty trimmers can also handle cutting cardboard, artist mat board, plastic sheets, acetate, and other thicker materials. This could be handy if you are into other paper crafts in addition to scrapbooking. If you're interested in card making, another factor to consider is how many sheets of paper the trimmer can handle cutting at one time. Are the markings on the trimmer easy for you to read? Most trimmers now come with markings to help you measure cuts for matting photos or making borders. However, some trimmers may have markings that are too small or too confusing to be useful to you. Can you purchase replacement parts at a store near you? Most scrapbook trimmers have blades or mats that will eventually need to be replaced. Having a source for these parts will spare you the annoyance of having to stop in the middle of a marathon scrapbook session just because your paper trimmer isn't working! Does your trimmer need to be portable? If you scrapbook exclusively at home, the size of your paper trimmer probably won't be an issue. If you like to attend crops, however, you'll want to pick a trimmer that is lightweight and small enough to fit into your scrapbook tote. Do you have small children at home who like to scrapbook? If your kids enjoy helping you make pages for your albums, look for a trimmer with features designed to keep little fingers safe. For example, many products in the Fiskars trimmer line are designed with a special safety blade.